If you are in want for a bit of a scare or a delightful spook, then a haunted hotel may just be the place you seek. Ghost hunters are not the only ones who notice unusual activity. Stay for a night or two if you dare, or come for a visit and go on a ghost tour. One of these haunted hotels may even be located in your backyard! The Armstrong Mansion (Utah): Not only is it a romantic getaway, it’s also a spooky one. A mischievous ghost or two have been known to play tricks on newlyweds and others who have come to stay the night. Light flickering, a quick burst of air, or sound of voices have had many contemplate who else is sharing the room with them. The Stanley (Colorado): If you have ever read the story, The Shining, The Stanley is known to have inspired its author, Stephen King. F.O. Stanley, the original owner of this historical hotel, is said to be haunting the public areas and probably not so public areas. Crescent Hotel & Spa (Arkansas): When it comes to being haunted, this hotel may be the grand prize winner. The hotel was once a hospital owned by a man named Norman Baker who performed many surgeries and tests although he had no medical training of his own. Many of Baker’s patients died under his watch. Multiple ghosts such as a stonemason or one of Baker’s patients have been seen lurking through the hotel. Ben Lomond Suites (Utah): Pay close attention to the elevator and maybe don’t stay in rooms 1101 or 1102…unless you’re up for it! Since the hotel was built in 1927, multiple deaths have opened doors to restless spirits who like to make the elevator go up and down or turn on the bathtub faucet at random. Hotel del Coronado (California): You may feel as if you have walked into a scary movie when you find strange occurrences happening around you. But not to worry, it’s probably just Kate Morgan, a woman who never checked out of her hotel room since she arrived in 1892. Jailer’s Inn (Kentucky): A jail turned bed and breakfast. Who knows, you just may be sharing breakfast with a deceased prisoner once sent to the gallows. Holiday Inn Express (Utah): This hotel, once named the Shilo Inn, is home to a tragic past where a mother murdered her children and then committed suicide. Many believe the children still roam the pool and gaming machine areas where laughter can be heard. 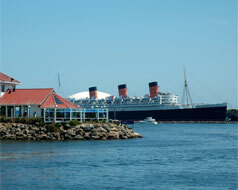 The Queen Mary (California): Nothing gets better than a haunted ship with a dark past! While not a hotel, visitors can come explore for a chance to see any paranormal activity. Where do you dare to go?